A spin off of Homeschooling Illinois - Legislation & Learning. One stop shopping for links and information to derail HONDA (HR 3753/S1691). If you know of a link, sample letter or otherwise useful information please drop me a comment or an email: homeschoolillinois [at] insightbb [dot] com. that is a DOD bill that will pass when it's voted on. Click on the title to head over to Cobranchi's to read about it. Tier 1 status for military enlistment is covered in Monday's post. Susan has a post over at the HILL blog. Back from vacation where we saw some Elk. It will take me a few days to get organized and caught up. 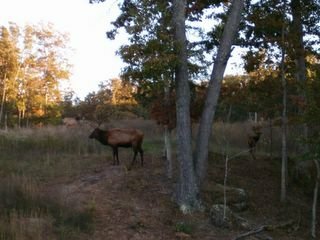 The picture is from the Elk and Bison Prairie at Land Between the Lakes in Kentucky. The Bison were in hiding. Much of my work this week has been behind the scenes, so to speak. I gave a little (we're talking 2 minutes or so) talk on a conference call about using blogging and webrings to be politically active. This was my first step out into the "political world" outside of homeschooling issues. I learned a lot and next time I'm sure I'll do better. If anyone is interested in starting their own blog or webring, I now have a handy dandy handout to get people started. There is a new piece on section 10 of HR 3753/S 1691 by Mary McCarthy. You can clink on the link in the blog title to take you there. There was quite a bit of information that I was unaware of in this article. Mary has footnotes and links for further reading. Just when I thought that all the information about HR 3753 had been discussed and I wouldn't be able to find more material, another person introduces something new into the discussion. I was emailed this today with permission to post it in its entirety. I felt like the blog fairy had stopped by my inbox. NHELD is preparing a series of bulletins detailing, section by section, the exact language of HR3753/S1691, the "Home School Non-Discrimination Act of 2005" as proposed in the House and Senate. The bulletins will provide the exact language from the bill, along with the exact text of the existing federal law that the bill proposes to amend. The bulletins will also include NHELD's comments on those provisions. NHELD is opposed to passage of any and all parts of this legislation. NHELD believes the entire bill should be killed and all previous federal laws already adopted having anything to do with the rights of parents to instruct their children at home should be repealed. Did you know that even the "Findings" section of HR3753/S1691 contains misleading and dangerous information? For ease of reference and because the House and Senate bills are identical at this point in time, the House version will be excerpted in these bulletins. To amend selected statutes to clarify existing Federal law as to the treatment of students privately educated at home under State law. This Act may be cited as the `Home School Non-Discrimination Act of 2005'. (1) The right of parents to direct the education of their children is an established principle and precedent under the United States Constitution. (2) Congress, the President, and the Supreme Court, in exercising their legislative, executive, and judicial functions, respectively, have repeatedly affirmed the rights of parents. (3) Education by parents at home has proven to be an effective means for young people to achieve success on standardized tests and to learn valuable socialization skills. (4) Young people who have been educated at home are proving themselves to be competent citizens in postsecondary education and the workplace. (5) The rise of private home education has contributed positively to the education of young people in the United States. (6) Several laws, written before and during the rise of private home education, are in need of clarification as to their treatment of students who are privately educated at home pursuant to State law. (7) The United States Constitution does not allow Federal control of homeschooling. (2) parents who choose this alternative education should be encouraged within the framework provided by the United States Constitution." Sections 1, 2 and 3 of this bill do not purport to change any existing federal law. This is an introductory portion designed to give reasons for the necessity for adoption of the bill. Because these sections do not purport to amend any particular existing law, NHELD cannot reprint for a comparison any other federal law. In other bulletins regarding other sections of the bill, NHELD will be doing so. For now, NHELD will simply provide comment on this introductory section. The purpose of the bill itself is objectionable. "To amend selected statutes to clarify existing Federal law as to the treatment of students privately educated at home under State law." Federal law does not need to be "clarified". The United States Constitution is abundantly clear in stating under the Tenth Amendment that the federal government has no delegated power to adopt any law regarding the education of children by their parents. The Tenth Amendment states: "The powers not delegated to the United States by the Constitution, nor prohibited by it to the States, are reserved to the States respectively, or to the people." The power to adopt laws affecting the right of parents to instruct their own children is not a power delegated to the United States by the Constitution. Therefore, that power is reserved to the States, or to the people. It cannot be clearer. Any law, no matter how beneficial it may appear, that Congress adopts that affects the right of parents to instruct their own children or that affects the children who have been so instructed, is unconstitutional, should not be adopted, and if already adopted, should be repealed. It is just that simple. The bill purports to clarify existing federal law as to "the treatment of students privately educated at home". If there is need to amend the "treatment of students", clearly, because that power is delegated to the states or to the people, the people in each state, if necessary, should seek amendment of their state laws. "(1) The right of parents to direct the education of their children is an established principle and precedent under the United States Constitution. (2) Congress, the President, and the Supreme Court, in exercising their legislative, executive, and judicial functions, respectively, have repeatedly affirmed the rights of parents." While the words may sound appealing, don't be fooled by them. The United States Constitution says absolutely nothing about the right of parents to direct the upbringing of their children. This is a "right" "found" by the U.S. Supreme Court, and other courts, in a few cases "interpreting" the Constitution. The U.S. Constitution also says absolutely nothing about the "right" of "privacy" itself. Again, this is a "right" "found" by the courts in the "penumbra", or "shadows" of the Constitution. Congress and the President have absolutely no business in "exercising their legislative and executive functions" concerning the right of parents to instruct their own children because the U.S. Constitution does specifically say that Congress and the President can only exercise their authority when expressly granted a power by the U.S. Constitution. All other powers remain in the states and in the people. Why are we allowing Congress to get away with such misstatements? Each and every Congressman took an oath to uphold, protect, and defend the Constitution. The Tenth Amendment is still part of the Constitution. Each and every one of the Congressmen who sponsored this bill should be reminded of their oath in no uncertain terms. Also, the federal courts do not have any jurisdiction to adjudicate cases and controversies involving the instruction of children by parents because that power was not delegated to the federal judiciary. The instruction of children by parents is a power that remains in the states or in the people. The federal judiciary only has authority to resolve cases and controversies involving federal issues or federal law. "The Judicial Power shall extend to all Cases, in Law and Equity, arising under this Constitution, the Laws of the United States, and Treaties made, or which shall be made, under their Authority; - to all Cases affecting Ambassadors, other public Ministers and Consuls; - to all Cases of admiralty and maritime Jurisdiction; - to Controversies to which the United States shall be a Party; - to Controversies between two or more States; - between Citizens of different States, - [and] between Citizens of the same State claiming Lands under Grants of different States." Furthermore, Article III, Section 1, states that federal "Judges hold their Offices during good Behaviour." That section gives the people yet another means by which they can demand that judges who are not applying the Constitution in their decisions may be removed from office by impeachment. In other words, it is now and always has been improper and unconstitutional for cases and controversies involving the right of parents to instruct their children at home to be adjudicated in a federal court, no matter how beneficial the outcome of a case has been or will be. Cases and controversies about the right of parents to instruct their children at home and the rights of children who have been so instructed, when necessary, are more properly to be adjudicated in state courts based on state law. The federal judiciary in reality has no jurisdiction to hear any case involving the instruction of children by parents. We must stop pretending that the U.S. Constitution says things that it does not. We must shout out loudly and clearly to the federal judiciary to stop this pretending. (5) The rise of private home education has contributed positively to the education of young people in the United States." Congress also is identifying the instruction of children by parents as "private home education". Instruction of children by parents currently is not considered to be "private education" in all states. Some states have no statutes defining "home education" at all. Amazingly enough, in some states parents are free to instruct as they please. Congress can adopt other laws that specify that only "private home education" contributes positively. In addition, the phrase "The rise of private home education" is an anathema and should be denounced emphatically as an abomination and complete distortion of historical fact. Parents have been instructing their children at home since the beginning of time. The phenomenon did not suddenly "rise" in the twentieth century. Only the terminology given to the instruction of children by their parents has changed. The term, "home school" has "risen" in recent years. The only thing that has "risen" in modern times is the number of people who understand anew that this is their parental obligation and who are undertaking the obligation to instruct their own children. "6) Several laws, written before and during the rise of private home education, are in need of clarification as to their treatment of students who are privately educated at home pursuant to State law." The phrase, "pursuant to State law" is also objectionable in that parents in certain states may be free to instruct their children at home without reference to any "state law" such that their "home education" may not need to be "pursuant to state law". It's called freedom. The "rise of private home education" is objectionable for the reasons already cited. "Several laws, written before and during the rise.are in need of clarification" is objectionable precisely because parents always have had the legal authority and the obligation to instruct their own children. Federal laws have been silent on this issue precisely because the Congress has no delegated power to involve itself in making laws on this issue. Since the year 2000, Congress, wholly unconstitutionally, has taken upon itself the authority to adopt and amend laws involving the right of parents to instruct their children. The only "clarification" these "laws" need is to clarify that they are wholly unconstitutional and must be repealed. "(7) The United States Constitution does not allow Federal control of homeschooling." The finding that "The United States Constitution does not allow Federal control of homeschooling" implies that the Constitution allows federal authority of some kind over "homeschooling". Congress effectively has taken upon itself to deem that Congress does have the authority to adopt laws of some kind affecting "homeschooling", hence, the proposal of this bill and all of the other federal laws it has adopted or proposed since 2000. Congress, then, has determined that it does have the authority, albeit wholly unconstitutionally, to "regulate" "homeschooling". The difference between "control" and "regulation" is merely a nuance of semantics. In reality, "regulation" by the adoption of any federal law is "control". Section 3 of this bill, the "sense of Congress", also is an abomination. (1) private home education, pursuant to State law, is a positive contribution to the United States; and (2) parents who choose this alternative education should be encouraged within the framework provided by the United States Constitution." Again, only "private home education, pursuant to State law" is deemed to be a "positive contribution". In addition, the instruction of children by their parents is being termed an "alternative education", when in reality, it is and always has been the primary form of education. Public and private schools have been the "alternative" for parents who were unable or unwilling to undertake their obligation to instruct their own children. The phrase "should be encouraged" is objectionable because the federal government should not be involving itself in any way with the instruction of children by parents. The phrase, "within the framework provided by the United States Constitution" is the only phrase that is not objectionable but it is doubtful that Congress actually has in mind the Tenth Amendment when it makes this statement. If Congress truly followed the "framework provided by the United States Constitution" it would immediately repeal all existing federal laws adopted regarding "homeschooling" and withdraw this and all other proposed bills having to do with "homeschooling". Ann Zeise's site is linked in the sidebar under the 2003 discussion. If you need to find anything out about homeschooling you will most likely find it on her site,A to Z Home's Cool Homeschooling Site. She has a summary of HR 3753 in her article along with links to the discussion on websites and blogs. I'm a mom of six who stays at home. I homeschool my children and have a lot of hobbies.